Washington (CNN) -- Republican Joni Ernst has a small lead over Democrat Bruce Braley in Iowa's Senate race, a new CNN/ORC International poll shows. Ernst had 49% support, topping Braley's 47%, in the survey of 647 likely voters, which was conducted Oct. 27-30 and has a margin of error of plus or minus four percentage points. 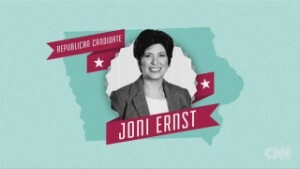 What makes candidate Joni Ernst special? The two candidates have exactly the same favorability ratings: Ernst, a state senator, and Braley, a congressman, are each viewed favorably by 49% of those surveyed, and unfavorably by 47%. Iowa is one of several states that President Barack Obama won at least once -- Colorado, North Carolina and New Hampshire are the others -- where Republicans are hoping to grab Senate seats previously held by Democrats. Their success in those states could determine whether the GOP captures the six seats it needs to become the Senate's majority party for Obama's last two years in office. 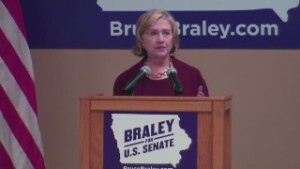 Democrats traditionally perform better among women, and in Iowa, the survey showed Braley with a 12 percentage point advantage in that category. But Ernst outperforms him among men, where she holds a 15 percentage point lead. 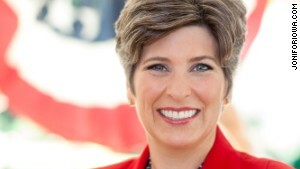 "Braley has an advantage among urban and suburban voters, but Ernst appears to be winning rural voters handily -- a key strength in a state like Iowa," said CNN Polling Director Keating Holland. It's just the latest poll to show a deadlocked race in Iowa, where the two candidates are battling for the seat of retiring Democratic Sen. Tom Harkin. A recent Reuters/Ipsos poll conducted Oct. 23-29 found the candidates tied at 45%. 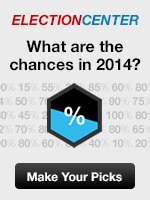 And a Quinnipiac survey conducted Oct. 22-27 gave Ernst a lead over Braley, 49% to 45%.